When last we met Percy Mayfield in the formative months of rock ‘n’ roll he was making his first recordings for a tiny West Coast label which was on the brink of going out of business. Though in the year and a half since then rock ‘n’ roll itself has taken off commercially and become the dominant form of music in young black America, the same can’t be said for Percy Mayfield who seems to be in much the same situation in which he began. He now finds himself at another small West Coast label which is also on the brink of shutting down operations. Even the record he’s releasing here is but a new rendition of the same song as his last time out. So surely this might cause you to think he was standing still, if not going backwards in his career. But the reality is that Percy Mayfield was on the precipice of becoming a star… except nobody at the time was aware of it, including probably Mayfield himself. The legacy – if not the appreciation – of Percy Mayfield remains far too under-recognized for somebody of his considerable talent and notable success. For a genre of music that was built largely on self-penned material by its artists and which has reserved some of its most fervent critical acclaim over the years for top flight lyricists (probably far too much acclaim for lyricists as a matter of fact, at least in comparison to those who excelled in other areas) it’s almost inarguable that Mayfield was the first who truly excelled in that specific role, bringing a mastery of language to a style that often relied on blunt terminology to impart its message. For that reason alone, showing the world that far from being just an expression of basic emotions as it first appeared to be, rock ‘n’ roll had the potential for cerebral insight as well, Mayfield’s work would be crucial in rock’s artistic advancement. But he was also crucial in rock’s commercial advancement when those haunting stories delivered with an affecting vocal delivery and bolstered by impeccable accompaniment of some of the West Coast’s best musicians started to become sizable hits along the way as well, then his catalog became all the more vital. But oftentimes people focus on what somebody is NOT and Mayfield, in an era where roaring sax players and vibrant gospel-infused vocalists ruled the day, was far less flashy than most. He was introspective, not boastful. He didn’t shout on the bandstand like so many others to knock you back in your seat, but rather he featured a mellow reflective tone that was designed to pull you in. Once he’d done so his songs made you think, not made you dance. But while all of that may have made him a less likely potential star, it also gave him the ability to stand out from the crowd. When everyone else was slugging it out to command the spotlight, Mayfield seemed to be surveying the action from the sideline, then after the more aggressive combatants knocked each other senseless he calmly strolled to center stage and delivered his songs without interference, captivating audiences who might’ve been weary from all the commotion that preceded it. Thus Mayfield did what so many others throughout rock history have sought to do – carve out a distinctive stylistic niche that was otherwise being under-served which his own skill-set was best suited for in the first place. For this he revisits his early effort for the Gru-V-Tone label, Two Years Of Torture, a meditative lament that had been presented in a musical setting so skeletal that it hardly seemed like a proper record, more like you were simply eavesdropping into a rehearsal that got captured on tape. But now he’s got a full band behind him featuring a bolder arrangement with horns galore, all of which might lead you to think it’d overwhelm him and lay waste to the story. But if so you’ve already made the classic mistake of underestimating Percy Mayfield. Likely it won’t be the last time you do so either. Mayfield has landed at Supreme Records, a more accomplished independent label out of Los Angeles who’d had success with a number of records but found themselves fruitlessly – although not without merit – pursuing a lawsuit against a major label for swiping their arrangement to their original hit A Little Bird Told Me by Paula Watson. The cost of the suit depleted their resources and when the judge rendered a decision against them (justified though it might’ve been on legal grounds, his commentary on the case was decidedly racist), it marked the beginning of the end for the label run by an enterprising black dentist named Al Patrick. That outcome was still a few months away but the writing was on the wall and so Mayfield’s tenure at Supreme was destined to be short-lived at best. He’d arrived there with a clutch of songs including Two Years Of Torture which he must’ve figured nobody had heard on his glorified demo on Gru-V-Tone released more than a year earlier. Patrick was impressed and while Mayfield still had designs on just being a songwriter – he’d written poetry as a youth and aspired to be a novelist but figured more people listened to music than read books – he was talked into singing the songs himself. That’s the story anyway, how much is true, how much is hyperbole we don’t know. It’s hard to imagine someone with a voice as warmly expressive as Mayfield wouldn’t want to use it to deliver the deep and seemingly highly personal lyrics of his own songs himself. If he DID envision others doing a better job on them than he was capable of he soon proved himself to be wrong, as he breathes life into the words, drawing them out at times, emphasizing different aspects to subtly alter the meanings, all while giving the impression that they were dredged from the deepest crevices of his soul. Whereas the original version of this had little in the way of instrumental support, even though the arrangement of what was included gave every indication it was a proper session, not a dry run-through that somehow got released, that sparse mood it created worked well to frame his resigned despair over losing a woman long ago. This time around he’s got some friends alongside him to help stave off the clinical depression of carrying a torch for so long in the form of Maxwell Davis and a stellar band that is credited to pianist Monroe Tucker (indeed the Supreme release has him listed as the artist with Mayfield’s name appearing only as the vocalist in small print!). The session however doesn’t feature Tucker on it at all. The piano player is actually the well-traveled Willard McDaniel, someone we’ll be meeting fairly frequently over the years here, and he’s joined by some heavyweights in the form of Marshall Royal on alto sax and Chuck Norris on guitar. Regardless of who got the credit it’s got Davis’s fingerprints all over the arrangement which at times leans a little too much towards big band styles, but in spite of that nod to the recent past it’s Davis himself who drags Two Years Of Torture back into rock’s safe environs with a particularly gripping and mournful sax solo. The horns that open it are indeed jarring, especially if you’re familiar with Mayfield’s earlier rendition and know his state of mind in this song, something which may have you inclined to check his pockets for razor blades or arsenic so despondent does he sound. But as unwelcome and intrusive as the bolder horns seem at first listen they aren’t there to try and “pretty this up” as you’d fear and they sure aren’t trying to make a pop tune out of this. Instead they act more as a contrast to the REST of the song, starting with McDaniel hammering the treble keys reflectively and answered by Norris’s biting guitar, which perfectly sets up the dichotomy of the situation in that while everyone around him is living their lives to the fullest he’s still grieving over a lost love from his distant past. Mayfield’s vocal when it comes into the picture is sorrowful as well as self-deprecating, almost as if he knows he should give this girl up in his mind and doesn’t blame you at all if you want to mock him for remaining hung up on her. He casts himself in the most pitiful light possible, a position which few artists would have the courage to do, not so much for the negative implications about him as a man you might have as a result, but merely because by doing so he’s all but guaranteeing he won’t get your sympathy. But then he goes ahead and manages to win you over all the same by how he lays open his soul with absolutely no self-consciousness, offering himself up as the living embodiment of aching vulnerability which must’ve been irresistible to women listeners who sought to comfort him and spring him from the emotional prison he’s locked himself in. It’s the conflict inherent within that makes this so notable. We have the conflict of the brassy horns running headlong into the dejected mood everyone else presents, the conflict of Mayfield’s better judgment being overruled by his aching heart and even the conflict of Davis’s solo, which sounds for the most part as if its sympathizing with Percy’s sad plight but which winds up cutting loose with a few more scorching lines that lead into Mayfield’s stop-time declaration of just how he can’t get over her “little brown body and sweet little baby ways”. When the horns return it almost sounds as if they’re laughing at him for being so pathetic that he’s actually counting the days since he’s been without her – 730 if you’re keeping tabs. Yet strangely, as disparate as the parts seem, it all tends to fit together nicely and makes his anguish seem all the more palpable, as if he’s fully aware that life is going on without him and yet he can’t pull out of the gloom to rejoin the human race. 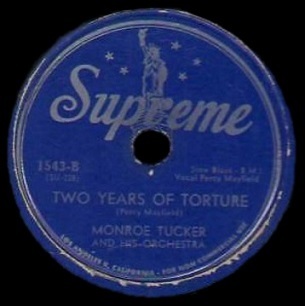 Which version of Two Years Of Torture is better is hard to say. Certainly this take on it is far more polished and features much better fidelity so I’m sure the preferred take is the Supreme release. It’s also what put Mayfield on the map, though not a hit this master was later picked up by Recorded In Hollywood when Supreme Records began closing shop in 1950 after it had sold well throughout California for months, and a year after that the master was again bought, this time by King Records, and re-issued after Mayfield had become a star at his next stop with Specialty. In fact Art Rupe, the founder and President of Specialty, sought him out after hearing this to begin with and so it’s kind of hard to argue with a calling card such as this. But the more barren version on Gru-V-Tone presents an even bleaker outlook and that is enthralling to hear as well, provided you can make out what he’s singing. Whichever one captures your allegiance the impression that Mayfield leaves you with is that he’s got a deeper mind than those out to merely get your legs shaking and juices flowing. He has the ability to use a smaller personal experience to frame a larger theme and by doing so ensures that listeners will be able to substitute their own stories for his and still feel a connection. If his earliest sides took on the role of auditions – for a record label or the general public, it’s essentially the same – his work that follows now on Supreme, coming two years later, remarkably presented him as a finished product. Whatever woodshedding he’d done during that time paid off as his vocal, lyrical and melodic qualities that would go on in time to be his trademarks are startlingly fully formed. His perspective of course, that distinctive attribute which set him apart from the rest of the pack of aspiring rock stars, was all his own from the very beginning. 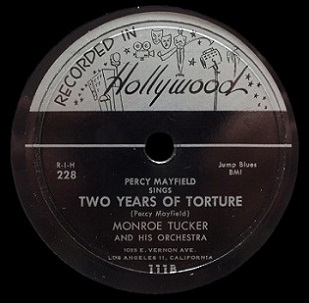 Leave a reply on "Percy Mayfield: “Two Years Of Torture” (version two)"